Junctioneer is a traffic intersection simulator that aims to fill the gap between transportation games and professional tools. It is intended to be used just for fun rather than for professional studies. Junctioneer is available for free of charge to download. The name Junctioneer is a combination of the word Junction and Engineer. 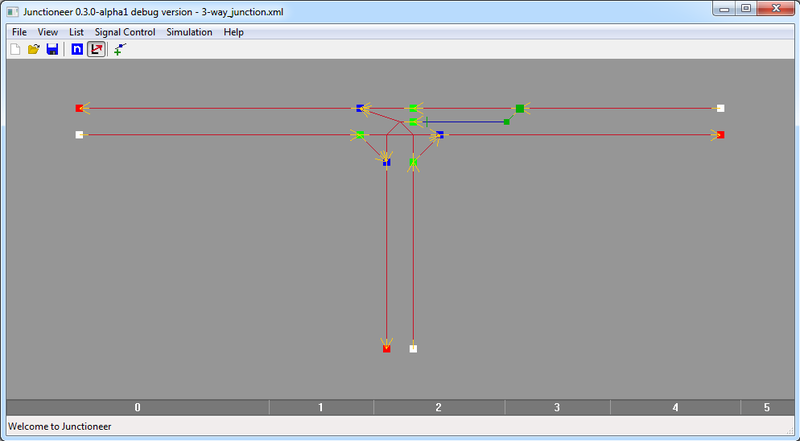 Junction nodes now support yield and stop control type. 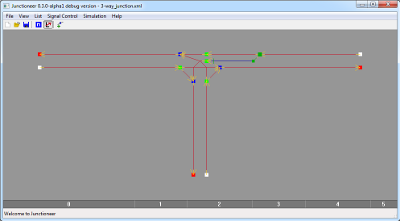 In Junction node, you can configure what outputs are reachable from what inputs. Thus you can configure yielding for two crossing links by splitting them and join via a junction node and then tell vehicles to not turn there. New Expression functions for reading traffic signal state. Chose 2D or 3D mode (simple 3D graphics). Note that in 3D mode, you cannot use the mouse to navigate, instead you have to use the Camera Control window for now. New GUI (see previous news post). However, you still choose Node or Link tool and depending on current selection get a list of possible actions. These actions are shown in the toolbar next to the selection of node/link tool. You can cycle active tool using the TAB key. It is now possible to specify height (z location) of link points via GUI. Thus you can now make bridges without hacking the save file. Make sure to leave a height of at least 2.0 between two links in order for vehicles to not collide. Options are stored in %AppData%\Junctioneer\ on Windows and ~/.junctioneer/ in Linux. Autosaves are however still made in the program folder, so it is still recommended to not install Junctioneer in a read-only directory. Possible something more that I have forgotten. For further help with the new version, see the updated Usage Help page and the updated Use Traffic Lights page. To download the beta, head over to the download page. There is still plenty to do for version 0.3.0 which will contain some exciting new features. Having said that, let me share a preview of the port of the GUI to use more standardized widgets using wxWidgets. The GUI will still build on the same basic ideas as the previous versions with tools and tool actions. Thus if you have learned 0.2.0, it should be easy to adapt to the new GUI. In this version, the safety distance between vehicles has been raised slightly. The car following model is still fairly simple and does for example use the same safety distance regardless of vehicle speed. Another limitation that still exists is that fast forwarding work by increasing the timestep, which affects how often the car following model is allowed to adjust the vehicle speed. The requirement of Gnu Scientific Library has been removed for Linux as it was only used in the Linux version. Now both versions use the same implementation that is independent of GSL. Today, December 17 I am happy to present the first public release of Junctioneer on over four years. The project has been restarted from scratch with only some parts that are common but enhanced since the old 0.0.0.x series releases on sourceforge.net. While the code that was released on sourceforge.net has been released under an open source license, this version released here on junctioneer.net is released under a freeware license (closed source, but free to download). Please note that while this release has a lot more than the one from four years ago the version number is still low and there is room for a lot more work on it. The program is still very much under development.